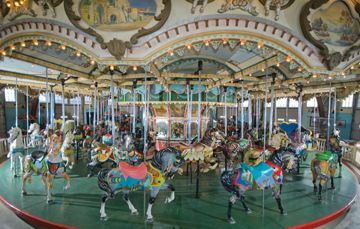 Neutral Milk Hotel multi-instrumentalist and Music Tapes frontman Julian Koster has sent out a request for fans to help save an 81-year-old carousel that needs some repairs. The National Trust for Historic Preservation will be awarding funding to a number of sites in the Greater Boston area, but the winner of a public vote is guaranteed to receive a grant. Unfortunately, we live in a world where the great whirling contraptions of mechanical music and light are not as profitable to operate as other things, and carousels are worth much more taken apart and sold in pieces to museums, where one must pay to look at them behind glass, rather than having them simply existing in the world that we now all share. I spoke with Jeff and Scott and Jeremy about this and they agreed that I should, on behalf of Neutral Milk Hotel, make an appeal to the good people who might have enjoyed the music made over the years, because we think you’d understand especially, and want to help. Those dudes certainly love their “whirling contraptions,” so you can see why they’d support something like this. Then again, instead of asking internerds to vote online, maybe they oughtta just get the band back together and play a fundraiser! I mean, I love merry-go-rounds as much as the next guy, but it’s sort of hard to suggest that the Paragon Carousel is more historically important than the Paul Revere House or the Perkins School for the Blind, but whatever. You can vote once a day through May 17 once you hand over an email address (verification not required). Neutral Milk Hotel: iTunes, Amazon, Insound, wiki. The Paragon Carousel is a beautiful machine that has been my dear neighbor for many moons. Now 81 years old, it is in need of a little love and attention in order for it to survive. It is my sincere wish for the Paragon Carousel to be a part of the magic of long seaside summer afternoons for many years to come. But it might not get to. We humbly ask you to vote! The Paragon Carousel is competing with 24 other historic Massachussettes buildings for a grant of $100,000. The historic site with the most votes wins, and anyone anywhere can vote. We would love it if by our collective effort we could ensure the continuation of this grand place. It only takes a moment and you can do so here. You are allowed to vote once a day untill May 17th . Your vote means a great deal to all of us at Elephant Six. Places like this are so special. They deserve to exist in the same world that we do. So we can visit them with our bodies, not just our memories and dreams. We’d like to thank you for your help and for spreading the word. Update: Paragon Carousel wins $100,000 prize in preservation contest. There, the fans did you a favor. Now do us one: record a new album or at least play some shows!